I think it's interesting that Hamilton had a separate line of quality watches outside of their primary trade line. In fact, if you include the Awards Division, they had two separate lines of quality watches. However the Awards Division makes more sense, since the concept was to provide awardees with watches they would not find in their local jewelry store. The other separate line are M-series and F-series models that convention wisdom believes were intended or a nation-wide retail chain. The quality wasn't any different and the retail pricing wasn't any different either. So it really is a bit of a mystery but maybe the line was just a really big customer (or customers). M-models weren't shown in the catalogs so ID'ing them can be a challenge. They were made from 1961 through 1967. There is a book by Roy Ehrhardt, Jr that supposedly shows some of them but I'm not sure what it's called. He was a prolific collector/researcher of a variety of subjects including violins and pocket knives. There are a number of publications out there but I don't know which one specifically has some of the M-series models included. If you happen to know what it is, please leave a comment or shoot me an email. Fortunately one of my collector friends has some of the pages that identify the M models and I know my next project is a 1966 M 85-4. That means it was the 4th model to be introduced with a retail price of $85. The M 85-4 looks like a Thinline model of some sort with a florentine-engraved bezel and matching bracelet. It has a 10K RGP bezel and a stainless steel back. Priced at $85, the price was higher than similar models in the regular Hamilton lineup - for example the 1965 Darwin has a retail price of $69.50. My project watch looks great but it's not running. I don't think there are any obvious differences between M-models and the regular commercial line of models. This watch has a signed crown, just like it's contemporary peers found in the local jewelry stores at the time. This bracelet is made by Admiral. Other brands like Kreisler, JB Champion and Duchess made Hamilton's bracelets too. Other than some of the earlier circa 1950's models like the 1949 Dewitt, Speidel generally didn't make bracelets for Hamilton's models. The 17 jewel 681 is based on an A Schild 1200 movement. One way to tell that the M 85-4 is from 1966 is by the model number inside the case back. It ends in 66, indicating 1966. The other number is a unique serial number for the case back. Presumably there is a M 85-4 with a 2901 or 2903 serial number, etc. You can tell by the numbers on the back of the dial and the little notch on the edge (top left side) that this dial has been refinished. They did an excellent job on the radial finish, also called a "sole finish". While taking the movement apart, I had a hard time getting the center wheel out. There's a tiny amount of corrosion in the center and it was stuck. The movement is noticeably brighter and shinier now that it's been cleaned. It's also ticking away with good motion. Off to the timer to see how it's doing. It's running a little fast but that's easy to fix. The beat error is under 1.0ms so that's good. The amplitude is under 200 degrees though, which is too low for a fully wound watch. The amplitude is how far the balance swings from side to side when it moves. I like to see it over 250 degrees but I'll accept over 225 in situations where I don't replace the mainspring. A lot of things can cause low amplitude, including just being dirty and gummed up inside. When I reassemble a movement after cleaning, I check to see how freely the wheel train spins before I put the pallet fork or barrel in place. It should spin freely. So when I see low amplitude after assembling a movement I suspect it's related to the barrel... either the mainspring, the arbor, or the barrel cover. The mainspring could be set or lost some of it's potential energy. The arbor needs to spin in the barrel as the watch runs. The barrel actually spins as it turns the center wheel and the arbor is kept in the same position by the ratchet wheel. Any friction between the barrel and arbor will result in low amplitude. Also, if the barrel cover isn't completely flush with the barrel it can rub and result in lower amplitude. With that in mind, I pulled the barrel from the movement and reinstalled the barrel cover and the amplitude came up nicely. Now I can tweak the regulator index and slow the beat rate down a smidgen. With the movement running nicely, it all goes back together and looks pretty much as good as it did when I started. However, now the watch is running and well as it looks. 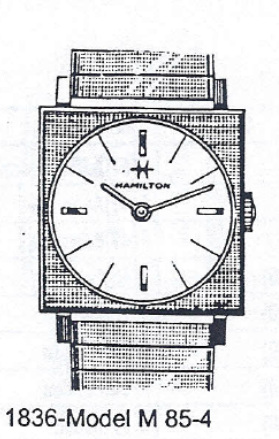 I doubt the watch looked much better than this when it left the showroom floor in 1966.